Picking out wedding colors is one of the first things you have to do when planning a wedding. Your wedding colors will determine the look and feel of your ceremony, reception, and even small details like your wedding invitation design. Start by deciding what style and feeling you want to create for your wedding day. Go with a wedding appearance that feels unified and looks like you. Color brings all of the elements of your wedding together from the invitations to the bridesmaid dresses to the wedding decorations. Pick a main color and one to two accents or two prominent but complementary contrasting colors. Don’t be afraid to throw neutrals or metallics into the mix for a robust palette or some added glam. For the trendy bride, you could also try colors that fall side by side on the color wheel to show off the understated shades of one color family. Ultimately get inspired by your setting as you start exploring wedding venues, and don’t overthink it! Look to what you love by gathering inspiration from your own home décor or wardrobe. And in the end, go with what you love because your wedding day is all about representing you. Start by picturing your dream wedding. Is the theme modern, rustic, romantic, or something else? Does the season matter to you? There are so many options to choose from if you want to go with a shade of blue for your main wedding color. You can try a pastel blue for spring, teal for summer, or royal blue for winter. Or maybe you want to go with an eggshell Tiffany blue, a color that also looks wonderful for bridal showers. Every shade of blue looks lovely on wedding invitations, table settings, and decorations. For a more specific blue color palette, we love pairing periwinkle or indigo. As mentioned in the introduction, choosing shades of blue that fall side by side on the color wheel is also a wonderful wedding color trend. Use this trend for ombre wedding details like flower petals down the aisle, bridesmaid dresses, or a layered cake. For details like the bouquets and table centerpieces, white or light pink flowers like roses and peonies make lovely accents to any shade of blue. With so many blue color choices available, you can’t go wrong with shades of blue for all of your wedding details and decorations. Peach and Gold: For this color palette, make peach the star of the show and accent with green and gold. Pair peach bridesmaid dresses with natural green bouquets and green plants to line the aisle. Use gold decorations for subtle items like the table settings and cake topper. And go with a classic white layered cake decorated with greenery and tiny gold details. Burgundy and Gold: Once again, don’t let green be the star of the show but use it as the perfect accent color to a burgundy color palette. For a fall or winter wedding, pick out dark burgundy bridesmaid dresses and accent them beautifully with white or light pink flowers surrounded by natural green. Go with the same theme for the table centerpieces and decorate a classic white cake with burgundy roses and natural green details. 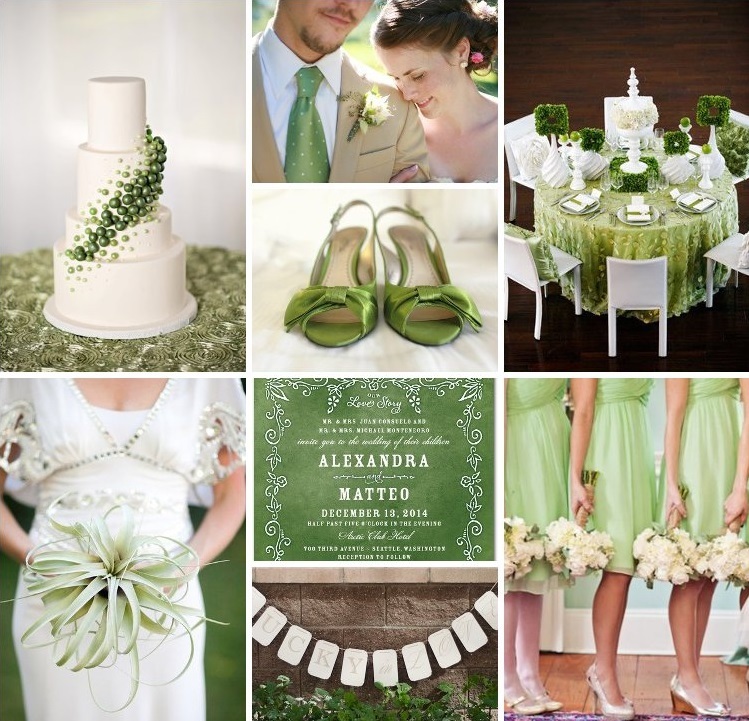 Simple Green and White: For a classic wedding look, you can’t go wrong with a simple green and white palette this year. Less is more with this trend that looks amazing for a rustic or minimalistic wedding. Deck out your reception hall with white twinkle lights and tea lights, choose a beautiful white layered cake decorated with natural greenery and white flowers, and use rustic wooden signs to welcome your guests. Wedding photos from 2018 will be filled with cranberry color palettes. This stunning saturated shade of red looks beautiful all year long, but especially for fall weddings. Your bridesmaids will love their cranberry dresses, and cranberry ties match perfectly with any suit color for the groomsmen. For accent colors to offset the dark cranberry, try natural green and light pink for the bouquets and wedding table decorations. Gold accents for the table settings and cake topper pair spectacularly with a cranberry color theme, and go especially bold with a gold cake and cranberry flowers if you want to try an extravagant trend this year. Pastels are trending on the wedding market in 2018, making them a brilliant choice for your wedding colors. Pink and purple pastels are especially great choices this year, and both colors complement each other well if you wish to combine them for your color palette. Try pastel bridesmaid dresses, light pink or purple painted mason jars full of baby’s breath for centerpieces, and pastel pink or purple ties and bow ties for the men’s side of the wedding party. Decorate the aisle with hundreds of pastel rose petals and add romantic details like pastel pink or purple tulle to the chairs at the wedding reception. 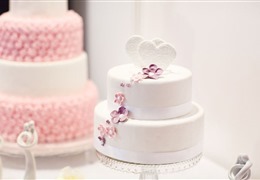 For a stunning cake, try all white layers decorated with pastel pink flowers. Gold metallic accents add a lovely touch of glam to pastel palettes. Go with bold details like gold heels or a gold cake topper, and incorporate smaller gold details with something fun like pink champagne in gold dipped flutes. An all gray color palette might seem boring or monotone, but it doesn’t have to be. 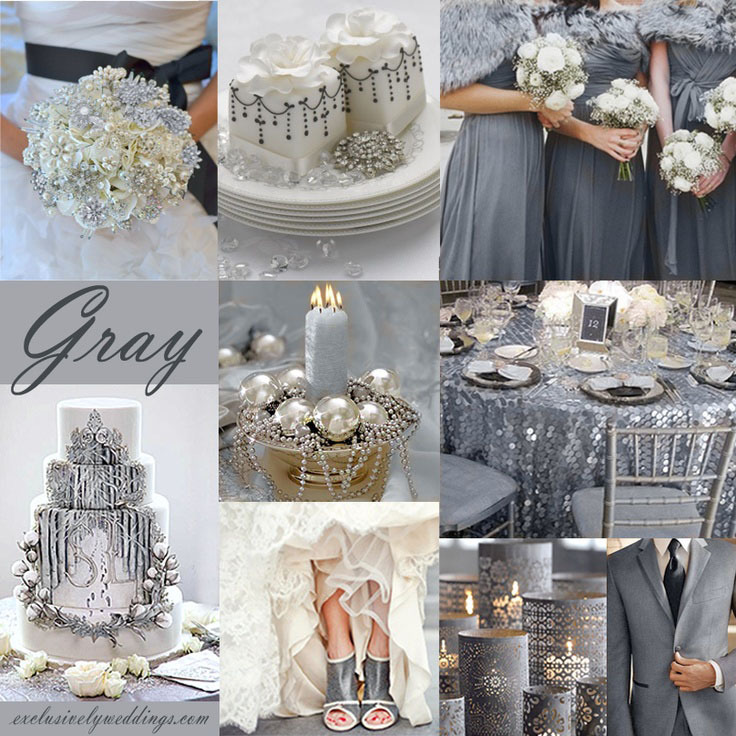 Gray is trending this year and it’s a lovely color if used correctly. Start with traditional gray and white lace invitations for your wedding guests. Flowy tulle gray bridesmaid dresses look classy and romantic next to groomsmen in tailored gray suits. 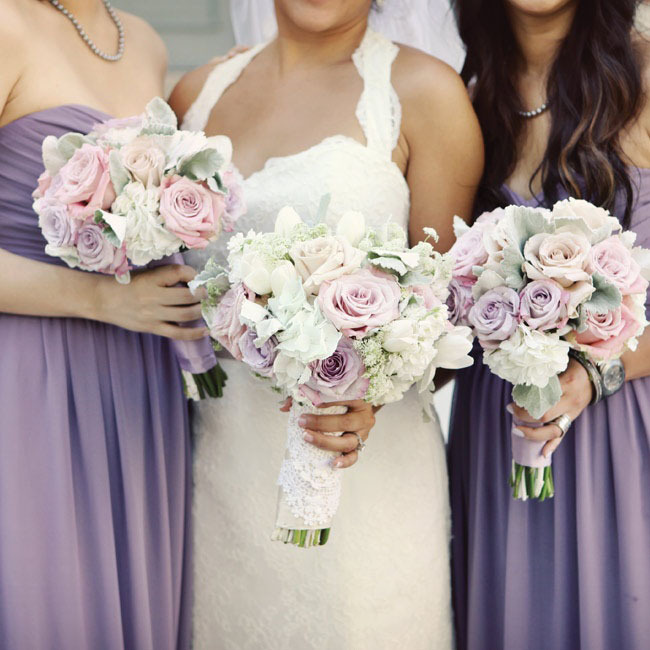 Accent gray decorations with tons of light pink flowers to decorate the aisle, create centerpieces for the reception, and contrast beautifully in the bridesmaid’s hands. Gold is also a beautiful accent color to mix with a gray palette. Try gray and gold macarons for fun wedding party favors, a white and gray layered cake with a metallic gold topper, and gold table settings accented by gray cloth napkins and light pink flowers in the middle. With these 2018 color trends in mind, picture your dream wedding to help you envision the perfect color palette. 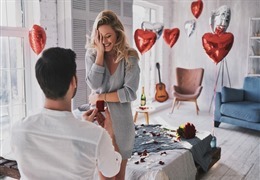 When you start going down your wedding checklist you’ll realize that choosing a color theme is one of the first things you have to do, and it’s a big decision to make. 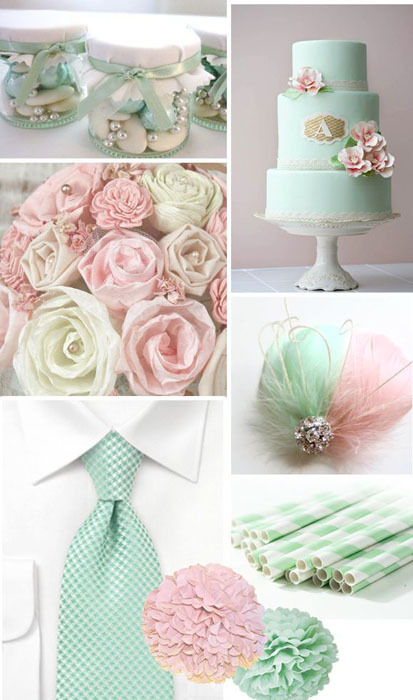 Wedding colors determine the look and feel of your big day and are incorporated into so many details. Choose colors based on a specific theme, to match the venue, to match the season, or simply go with the colors you love. The options are endless, and you shouldn’t be afraid to throw in accent colors for stunning contrast. Seek out inspiration from bridal magazines and blogs, from your own surroundings at home or in your wardrobe, and then ultimately choose what you love. If you go with what you love, your wedding day will come together seamlessly and represent you perfectly.